The piston seals of Freudenberg Sealing Technologies can be used in a variety of modern sealing systems: Their task is to seal the piston reliably against the cylinder tube and guarantee its movement efficiently with minimum friction and no drift. 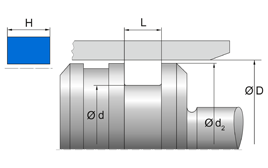 The piston seals persuade due to their durability and high functionality. They are suitable for all kinds of requirements.